Hahaha! I do the same thing when calls come through from numbers that look like telemarketers! Too funny that it was actually a real person trying to reach you. :) Love your "sweet" card, the ants add the perfect touch! Telemarketers are a real problem and with the political callers, the problem is exacerbated. Ugh! So glad you got to the brunch. This is such a cute, fun card and I especially like the addition of the ants! Adorable card, Linda. I love the marching ants and the banner! Those are the same techniques I use with those pesky calls! They ID is not usually anything specific though. Glad you got to attend the brunch and solve your mystery! What an adorable card! The marching ants is the perfect touch! And what a great story - did you fess up to Bob? This is absolutely adorable, Linda! Such great colors and layout. Love how you expressed this sentiment! Love that! Hugs. Oh what a funny story, Linda! I worked as a telemarketer for a very short period of time so I try to by a little more sympathetic, lol! Love, love your card! The little ants are the cutest and the sentiment is perfect! Charming!! LOVE the little ants running over the watermelon hill - and the way you've done the banner! That sentiment is SO true! 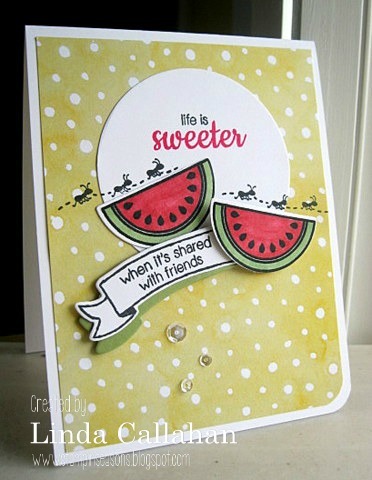 And that watermelon looks delish, what a fun card! How can ants be so cute? When they are on one of your cards. This is so cute and fun! Linda... so sorry you missed the memorial for your neighbor - all of us can relate to the relentless telemarketers. I do sometimes long for the days when callers were really callers! I LOVE this card. your little ants crawling across the card are just perfect with the sentiment. Made me smile. Oooh. Aaaah. Somehow I knew that there would be a Part II to this story. LOL! Oh no! I do the same thing....answer and hang up! OR hit the pound sign key several times! Obviously there are times that's not the right thing to do! Glad to know that AFL-CIO won't be bugging you any more, LOL! Anyway, your card is as sweet as can be! Love those little ants....only on a card, though, not anywhere else!